The 2013 NYC Men Having Babies conference took place on October 6th, 2013, at the JCC in Manhattan, which also co-sponsored the event. The outstanding hospitality of the JCC allowed the organizers to accommodate over 30 Gay Parenting Expo exhibitors, and offer 11 hours of educational programs to the 200 parents, prospects and professionals that attended. The conference also marked the official launch of the organization’s Gay Parenting Assistance Program. MHB provides unparalleled opportunities for any gay person considering having children through surrogacy, to get unbiased information, access a wide range of relevant service providers, and connect with others going through the process. This year the organization also added several programs for gay men who are already parents, as well as for men who are HIV positive. More than 30 clinics, agencies and community organizations from across the USA and beyond exhibited, hosted breakout sessions, and for the first time, also offered on-site consultations. The newly introduced “Surrogacy 101" intro session attracted about 70 early risers who received first-hand advice from experienced gay fathers. It was followed by an expert panel, and a panel with personal stories from dads and surrogate. A book fair with children’s books featuring gay dads, egg donation and surrogacy arrangements was also very popular, and will continue to be available on the organization’s website. An afternoon special panel on “Surrogacy parenting for HIV positive men” featured the premier specialist in the field, Dr. Ann Kiessling from the Bedford Research Foundation, Dr. Doyle of CT Fertility, an HIV positive dad, and a surrogate who is currently carrying for an HIV+ couple. A panel on "Speaking to children on surrogacy and gay parenting” concluded the day and attracted several dozen men who are already parents, in addition to prospective dads and professionals in the field. It featured psychologists, gay fathers of older surrogacy children, and a researcher from the Cambridge University Centre for Family Research, known for their pioneering research on unconventional families including those headed by gay fathers or created through surrogacy. The Conference was hosted and co-sponsored by the LGBTQ department of JCC in Manhattan, headed by Sarah-Kay Lacks, which provides social and cultural programs year-round to LGBT people of all ages, backgrounds, and parenting status. American Sign Language interpreters were offered to accommodate several deaf prospective parents who attended the conference as well. During a briefing session at the conference, the MHB board provided an overview of the organization’s development and future plans. They thanked the organization's loyal partners, and especially the conference’s one Platinum and eight Gold sponsors. The Platinum sponsor, CT Fertility, has already supported Men Having Babies in various events since 2009, and was MHB’s lead supporter last year with over $20,000 in donations and event sponsorships. 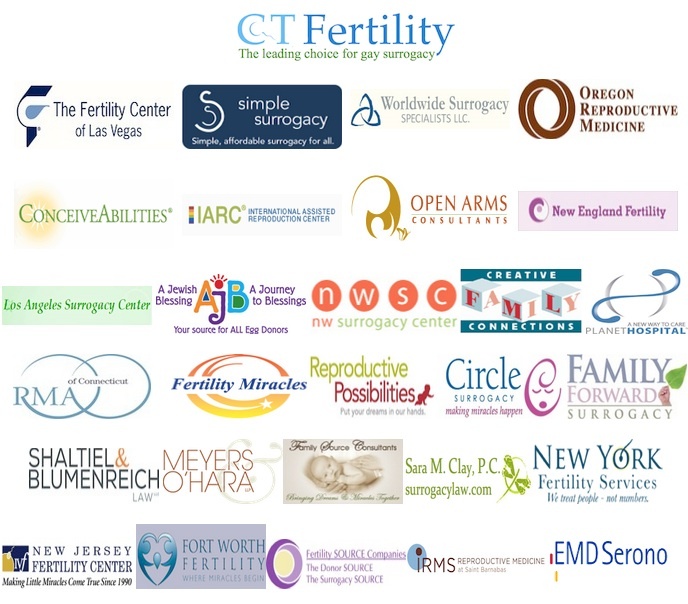 "We are proud to have been one of the first IVF clinics to welcome and proactively help gay men become parents," said Dr. Michael Doyle, the founder of CT Fertility, and resident expert on prominent community forums including Family Equality Council, Proud Parenting, and the NYC LGBT Community Center. Furthermore, the clinic also designated our Gay Parenting Assistance Program as one of the beneficiaries of their "CT Fertility Gives Back" initiatives, and invited current and former clients, staff and friends to "join them in celebrating the gift of new life by making a supporting donation" to MHB on their campaign page (www.ctfertility.com/donate). After the event the organizers were flooded with messages from grateful attendees. “We just had to say THANK YOU for organizing such an amazing and informative program. We left today's event positively overwhelmed with information that will definitely enhance our love and family,” said one couple. “I wanted to take a moment to congratulate you on the tremendous success of yesterday's event… I understand more than most how challenging it is to accomplish what you did yesterday, particularly with that level of turn-out - very impressive, indeed,” wrote an industry professional. “My husband and I had a failed transfer earlier this year which was a setback for us both emotionally and financially,” said another couple. “Admittedly, we were discouraged, but, after attending yesterday, we have restored hope as we plan the next phase of our journey. Thank you for that.” A prospective parent who also attended the conference last year wrote: “My first conference was last year -- that was my first introduction to the whole world of Men Having Babies. What growth in a year!"